There are no words to describe the absolute crap that is this film. It tries to nudge its way into the horror/comedy genre but the only thing laughable about this movie is the script, and the only thing scary is the acting. The Best Part of The Movie. I Just Saved You Three Dollars. This pile o’crapola tries to tell the story of a group of college kids, played by 30 year-olds naturally, telling ghost stories in an isolated cabin. One chick tells about the Hellgate Haunting. It is about a young woman who was accidentally killed while being harassed by a bunch of bikers in the 50s. Her father comes into the possession of a glowing crystal that brings dead things back to life, or horribly mutates living creatures, that ultimately blow up in under a minute. Somehow he is able to keep his daughter alive without her blowing up, and now she haunts the highway and lures lost drivers into the ghost town of Hellgate. One of their friends gets lost on the way to the cabin and encounters aforementioned succubus. Escaping from the overprotective father, this guy returns to his friends and, feeling gallant, wants to return to Hellgate to save the chick. Crap movie ensues. First of all this movie can’t seem to differentiate the 50s from the turn of the century, and every EVERY car in the film has a vanity license. Secondly, one of the bikers who survives the father’s revenge shows up in present day looking EXACTLY THE SAME except for some poorly frosted hair to indicate that he is older. Right. Then the succubus from the 50s, who looked hot in pigtails, looks like a reject from a Whitesnake video in the present day. And you know a movie is not funny when all the characters in the movie laugh at their own really really bad jokes. Hey Lady, Whitesnake Just Called. They Want Their Look Back! 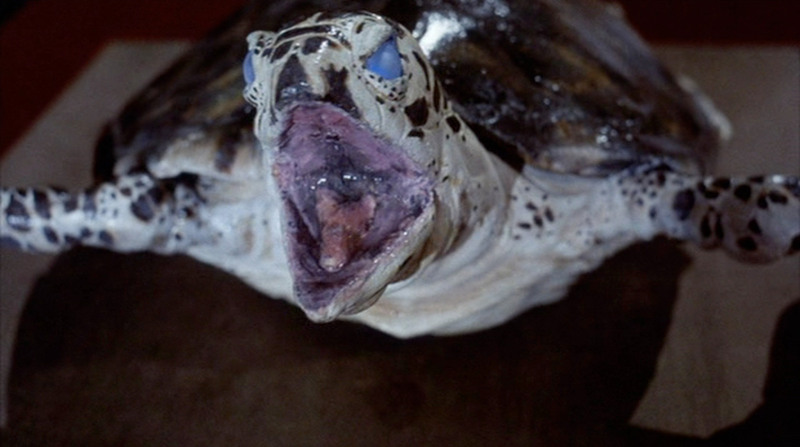 The laughs are unintentional, the scares are boring, the make-up and gore is amateurish, the nekkid chick is not attractive, the young kids are played by 30 year-olds, and the bad guy looks like a poor man’s Mad Max rip-off only because his face was bitten by a zombie sea turtle. If you can find pleasure in any of this, I don’t believe you. On deck, I have two J-horrors: the anthology Three… Extremes, and Uzumaki.